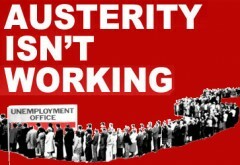 Austerity isn’t working. The disastrous Tory economic experiment has left the economy stagnating, household incomes falling at their fastest rate in decades and unemployment soaring towards three million. Even by the criteria the government has set itself, that of reducing the deficit, it is failing. The Tories are set to borrow £158 billion more than they planned! In contrast to the government’s rhetoric, the most vulnerable are being hit hardest. A generation of young people is having its hopes ripped away. The Tories seem to think that one-in-five young people being out of work is a price worth paying. Despite this, the Tories are ploughing on regardless with much worse to come. In the Autumn Statement the Tories extended deep spending cuts and pay squeezes for two more years and so into the next parliament. The Institute for Fiscal Studies has warned that 88% of the benefit cuts and 94% of cuts to government departmental spending are still to happen. Greece and Ireland are the clearest examples how such austerity can destroy the economy and the very services that strengthen our society. Despite numerous austerity budgets both economies remain more than 10% smaller than they were five years ago! Such austerity policies have undermined the UK economy meaning it remains 4% below its pre-recession peak, whereas Germany, and the US have recovered their lost output. Clearly slashing government spending should be opposed. Not only is it socially regressive but it damages an already fragile economy. Likewise backing real term pay cuts for millions of public sector workers is not only bad politics for Labour but bad economics as it reduces economic demand further. Creating growth, jobs and higher living standards should be the priority. Not only would this stop millions of people stop getting worse off but it would see government debt fall as increased economic activity leads to businesses and workers paying more tax and drawing less in benefits. Increasing investment, not making cuts, is the solution to the economic crisis. It is important to emphasise that that higher government debt is a direct result of the recession and lack of growth – not the other way around. As can be seen in the graph, prior to one of the deepest recessions in history hit in 2008, government borrowing was lower than for most of Thatcher’s time in office. Borrowing soared following the onset of the crisis, the government had to step in to keep up demand in the economy as household and private businesses cut back on their spending. As a result borrowing of course went up, but many economists have warned that without this the economic position would have been much worse. Furthermore, as the excellent website False Economy highlights, UK debt has been much higher in the past. In fact for a large part of the past century it was substantially higher. It peaked after the Second World War at nearly 250% of GDP. A huge stimulus in the form of the creation of the welfare state, the NHS, council houses and much more then meant that the economy grew and debt levels came down. Such a process is exactly what we need today. The debt should be brought down but through growth. Yet the government has no growth plan – just an austerity drive. That’s why Labour is right to back a stimulus such as outlined in its 5 point plan for a £2billion tax on bank bonuses to fund 100,000 jobs; bringing forward long-term investment projects; reversing the damaging VAT rise; a one year cut in VAT to 5% on home improvements; and one year national insurance tax break. As the economy has stalled living standards have been hit, further depressing the economy as demand falls. However the core of the ongoing recession has been the collapse in private sector investment. As Socialist Economic Bulletin has pointed out for most of the recession, this accounted for well over half of the fall in GDP. With household incomes being driven backwards and the private sector not investing it is clear that government has to step into the void to ensure there is investment which will create growth. Below are ways that this can be done. Of course the Tories will throw back the charge that this is unaffordable. But that ignores basic economic facts and the seriousness of the economic situation. With the current depression in the economy having lasted longer than that in the 1930s it is time for bold solutions to these very deep problems. Growth, living standards and jobs need to be at the centre of the debate and progressives need to strengthen our voice against the Tory attempt to restrict discussion to one of cuts and economic pain. Just as cuts deepen the recession, investment can get us out of it. Stimulating the economy through government investment in housing, public transport, education and green measures would not only address important social needs but would expand the whole economy and so increase revenues going back to the government. In the economic jargon this is the multiplier. Others argue that government borrowing costs are so low – even negative in real terms – that investment can be paid for through borrowing. The Tories argue this is not acceptable – but they are borrowing £158billion more than planned due to the low growth resulting from their policies. It is surely better to borrow to invest in jobs and growth rather than to fund a failing economic policy. Of course there are also many ways that the government could raise money to spend on stimulating the economy. The TUC published The Missing Billions which revealed that the public purse loses £13bn a year through tax avoidance by the wealthy and £12bn a year through tax avoidance by corporations. Funds for much needed green investment are proposed by Compass with calls for a “a levy on the Big Six, with funds raised ring-fenced to help people with their energy costs, prioritising those living in fuel poverty, by making homes more energy efficient”. This could also help create green jobs. The government could also impose a special tax on huge company cash reserves and dividends which could fund investment. A Robin Hood tax on financial transactions could raise £20bn a year. Whilst scrapping Trident nuclear weapons replacement would save tens of billions. Posted in: Economy, Employment, Macroeconomics, Public Spending.